Commercially important as the producer of dates, Phoenix dactylifera is extremely variable with hundreds of named cultivars, which are propagated by suckers or increasingly in vitro. It is also widely used as an ornamental. Taller, thinner, and with spikier, bluish leaves than its popular cousin from the Canary Islands, it is a handsome tree. 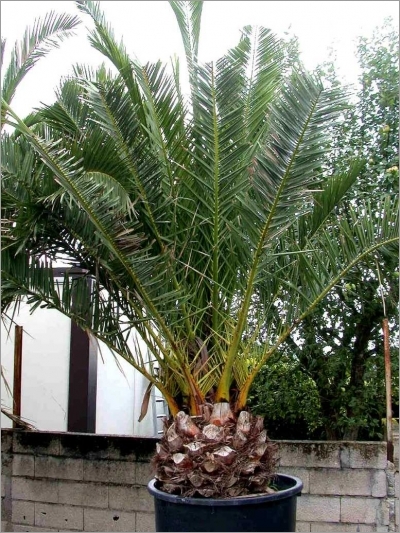 Its adaptability to a wide range of climates, excellent resistance to drought, salt spray, brackish water, and various pests, and its general robustness make it the palm of choice for dry climates, temperate as well as tropical. The seeds we offer here come from the famous date groves of Morocco, and even though these seeds are intended for ornamental use, the quality of the fruit from the resulting plants should be very interesting.